No. 19 comes to the market in excellent condition throughout and has been very well maintained by its present owner. The property benefits from double glazing throughout, gas fired central heating and off-street car parking with front and rear gardens. The property overlooks a large green area to the front and is not over looked at the rear. The spacious living accommodation comprises of entrance hallway, kitchen/dining area, guest w/c, hot press, living room, three bedrooms with master ensuite and family bathroom. 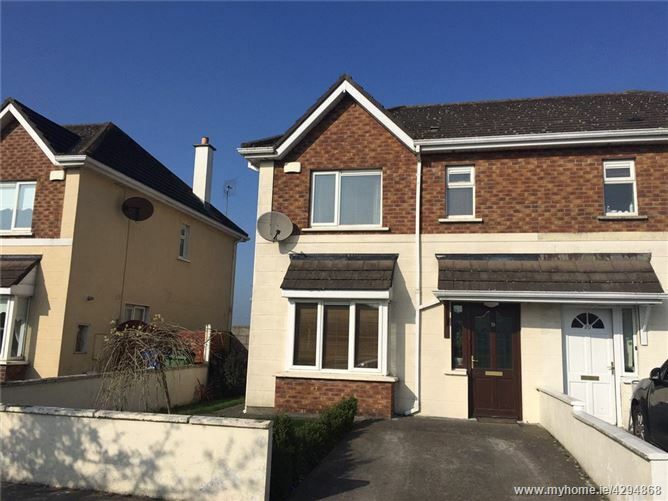 Rheban Manor is situated just off the Dublin Road and is within walking distance of the Athy town centre and Athy train station. This property should be viewed to be truly appreciated. Entrance Hall 4.97 x 1.89. Wooden floor. Carpet to stairs. Guest W/C 1.76 x 0.9. Toilet. Hand basin. Ceramic floor tiles. Kitchen 5.55 x 2.98. Fitted kitchen and worktops. Oven & hob. Bay window. Blinds. Ceramic floor and walls tiles. Light fitting. Sitting room 4.98 x 3.58. Open fire place. Wood floor. Blinds. Sliding patio door to rear garden. Light fitting. Master Bedroom 3.89 x 3.35. Fitted wardrobes. Laminate wooden floor. Blinds. Curtain pole. En-Suite 1.86 x 1.78. Shower cubicle. Wash hand basin. Floor and wall tiles. Toilet. Blinds. Bedroom 2 3.3 x 2.8. Carpeted. Blinds. Curtain pole. Bedroom 3 3.31 x 2.07. Wooden floor. Blinds. Curtain pole. Bathroom 1.69 x 2.3. Bath. Wash hand basin. Toilet. Blinds. Floor & wall tiles. Landing Retractable ladder to attic. Attic partially floored. From Athy town centre proceed out the Dublin road. After Lidl take the left at the traffic lights and take the next left into Rheban Manor. Proceed straight and take the left turn before the pillars into Holland Park. Proceed to the end of this road and No. 19 is located on this T junction.